Ever wanted to something crazy and different for your partner and yourself and something that hasn’t yet been done? The usual candlelight dinners, the long drives, the flirtatious texting, and a moderate dose of fights and misunderstandings. Sounds like the rinse-and-repeat cycle every relationship passes through at some point or the other. Throw in flowers and gifts to the list and a bunch of holidays taken together and you have a more serious relationship. These are all clichéd and yet make you feel special no doubt. But there’s more that can be done, and that too on a consistent basis. Here’s the perfect Android app meant for you and your beloved or betrothed one. Its name is Avocado. This sweet little Android app is simple wherein it lets you and your better half share a special relation through a variety of wonderfully unique communication features that keep you connected and nurture your relationship in whole new ways. It accentuates the process of realizing just how special your special someone can be in a faster period of time to help you be more decisive and also keep you on your toes to keep the sparks in your relationship still flying. It helps you to connect better and to an extent, get rid of those fights and annoying ego clashes too. And how is that? You’re about to find out. The Avocado Android app is built to ensure that there is fast and secure messaging between the two individuals. The smooth and highly organized messaging feature is just the beginning of a host of fantastic features available via this fancy smartphone dating platform. 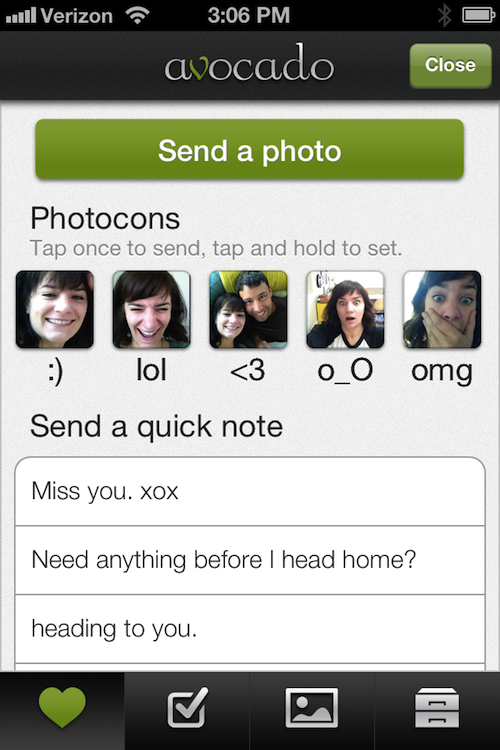 The awesome messaging feature is merely the tip of the ice berg of this excellent dating app. Here you can talk to each other and send doodles and custom emoticons through the app. You can even send images and add doodles to the image and send in a kiss with a picture which will have the image of a set of lips on the image that you have sent. You then have the ‘lists’ where you can create and share items and tasks that have to be done and here you know that both have a copy of what is there. These could be groceries, shopping lists, things to buy for the apartment and a lot more. You can send these lists to each other through the app and you can also edit them. The best part about this is the fact that you get an intimation in the message bar that says that a list has been edited. This way you know for sure that there is an amendment that has to be undertaken. The screen is split and you can also see the contents of the lists to the right of your screen on a tablet. The events section is a calendar where you can pick a date and add an event to that which again will appear in your lists of events. This way between you and your partner can remember what events up next and make sure you’re provisioned for it. The images and the outlay is optimised for the small screen as well and matches the requirement completely. The interface of the Avocado app is incredibly user-friendly and easy on the eyes at the same time. There barely is anything to learn here in this neat and forthright little app. All the information you ever needed to know your partner and be known to him/her is there right in front of you at the click of a button. All you have to do is make the right moves and get the romance bubbling effortlessly.